While some of the criticism on bullfighting centers on animal rights (this argument being the least strongest, considering that hunting for survival, food industry or pleasure are stone age and modern day practices), the strongest critiques focus on elevating violence through sport. 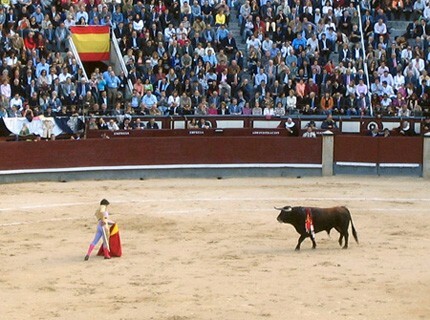 The counterarguments of the taurina community in Spain, as well as in other countries where bullfighting is practiced—mostly found in Latin America—frame bullfighting as an artistic expression and cultural tradition. And this all sounds like rhetoric until you’re there, bearing witness to the dance and spectacle of the matador and the bull. Like every art form, bullfighting does indeed have a universe and language of its own. Yet, some things, perhaps the matador’s tactics of torture and distraction, now feel overtly familiar—and to the trepidation of all. No less intense was the visit to Goya in Times of War at El Prado. The exhibition covers a span of twenty-five years of the life and work of Goya, from 1794-95 to 1820. This is a period of intense political changes and war in Europe that affected Spain as every other country. During this time, Goya created what were then as today some of his most celebrated works, including the series of prints and drawings of Los Caprichos, Disasters of War and Tauromaquia. The introductory wall text to the gallery with the last of these aforementioned series states that Goya’s series of "Tauromaquia has to be understood as more than a mere illustration of the history of bullfighting. The time at which this series was created and the resulting images suggest that beneath this apparent intention lies Goya’s need to express his criticism of man’s deep-rooted cruelty, which he himself had witnessed. Brutality, which is explicit from the outset of the series, is an inherent characteristic of the bullfight, and we can interpret the artist’s characterization of the figures from this world as a veiled critique of human barbarity, already expressed shortly before in the Disasters of War. In its representation of the bullfight, the Tauromaquia emphasizes the idea of a combat between victory and torturers in which terror and madness prevail and in which death is the only outcome." Antoni Muntadas’ video screening was part of Rencontres Internationales, which was what brought us to Madrid, since Tom Cruz was participating in the same video and film festival, and he invited me along. On Translation: Fear / Jauf will next be broadcast on Al Jeezera TV.